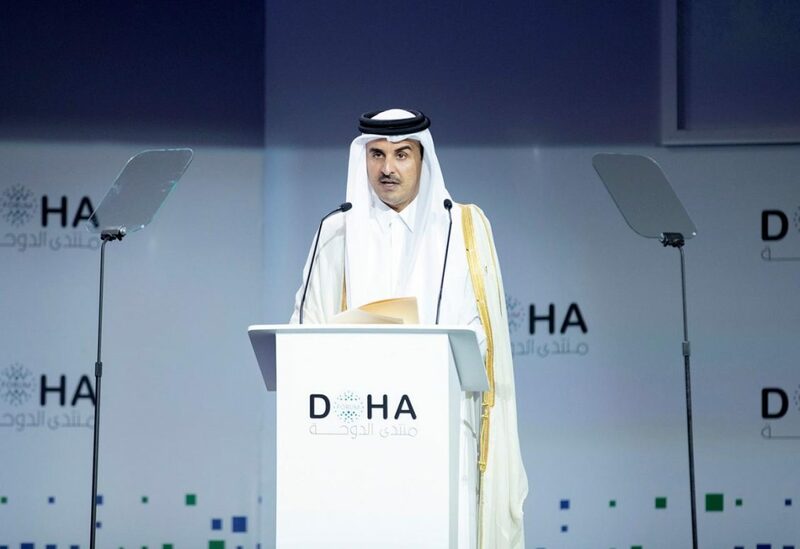 Amir of Qatar Sheikh Tamim bin Hamad bin Khalifa Al-Thani speaks during Doha Forum in Doha. Qatar’s emir will visit Beirut on Sunday for an Arab economic summit which has been marred by regional rifts and internal Lebanese disputes even before it began. Lebanese President Michel Aoun’s office said on Saturday Sheikh Tamim bin Hamad Al Thani had informed it he would come to lead the Qatari delegation. Rifts among Arab states over Syria and its ally Iran, on top of divisions inside Lebanon, have overshadowed the summit, with several leaders pulling out. Although at least eight heads of state were originally due in Beirut, only the Somali and Mauritanian presidents were expected to come, a source in the committee organizing the event said on Friday. Some of the 20 countries taking part, such as Egypt and Kuwait, are sending prime ministers, foreign ministers or finance ministers. Officials have dismissed the idea that the event would be poorly attended. Last month, Qatar’s emir turned down a Saudi invite to a Gulf Arab summit, sending his state minister for foreign affairs, as a bitter row festers in the six-nation Gulf Cooperation Council. Saudi Arabia, the United Arab Emirates, Bahrain and non-GCC member Egypt cut diplomatic, trade and transport ties with Qatar in June 2017. They accuse Qatar of supporting terrorism and cultivating ties with Riyadh’s regional foe Tehran. Doha, which denies the charge, says the boycott seeks to curtail its sovereignty, while the row has defied mediation efforts by Kuwait and the United States which sees Gulf unity as essential to containing Iran. Ahead of this week’s Beirut summit, a key point of contention has been whether to welcome Syria back into the Arab League, now that President Bashar al-Assad has restored control over most of his country, with Iranian help. Lebanon’s Iran-backed Hezbollah, which fights alongside Assad, and its political allies including Aoun have stepped up calls for rapprochement with Damascus.